DR98959 & DR98909 pass Baulking, on the Great Western Mainline between Swindon and Didcot, with the 3S32 08:29 Ledbury to Didcot Railhead Treatment Train on 27 October 2008. This location is not much use for a normal length train, as only a short section of track is visible, but is ideal for this working. 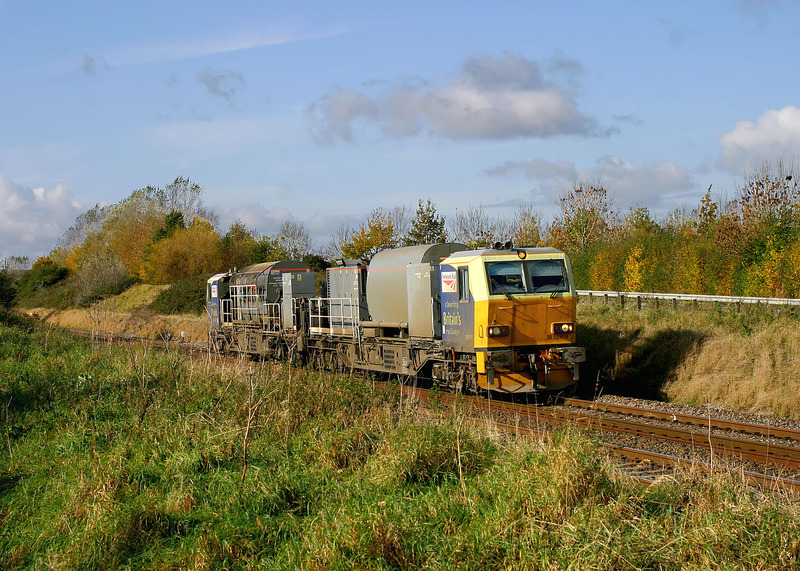 It is one of the relatively few locations on the GWML where there is a display of autumn foliage in the background, which after all is the reason that this train is operating! The Armco barrier visible in the background is where the Stanford-in-the-Vale road parallels the railway for a short distance. This road was only constructed in the 1970s, when a large fuller's earth quarry was opened nearby obliterating the course of the original road. The quarry closed in 2005.